Brothers Jordan and Alex McKay, owners of Willowtree Farm in Port Perry, have been honoured as one Canada’s latest Outstanding Young Farmers (OYF)! The OYF Program is designed to recognize young farmers between the ages of 18 to 39 that exemplify excellence in their profession. The McKay family farm first opened in the late 1960s, when Jordan and Alex’s parents bought the land to start a dairy and cash crop farm. The farm has continually evolved ever since, with the focus eventually turning to beef cattle and an expanding list of fruits and vegetables. Then In 2016, the McKays opened a 4,300 sq. ft. retail year-round market at Willowtree, complete with a butcher shop, commercial kitchen and cafe right on the farm. Now the McKay brothers are being celebrated for their passionate and progressive work in transforming the family farm into a vertically integrated farm that focuses on farm fresh local food. Together, the brothers have moved Willowtree through impressive growth, increasing the Durham Region farm to 650 acres, with about 25 employees in the winter and over 90 in the summer, and producing 35 hand-picked crops, 65 sheep and 102 cows. “Alex and Jordan, along with their families, have successfully harnessed their complementary skills resulting in a multiplier rarely seen,” shared Franck Groeneweg, Canada’s OYF Program 1st Vice Chair. 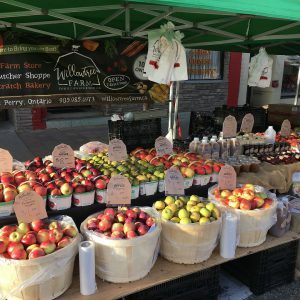 Learn more about Willowtree Farm on their website and plan a visit soon – along with the fresh produce, cafe, bakery and butcher shop, they also currently have a free ice skating rink open during business hours! 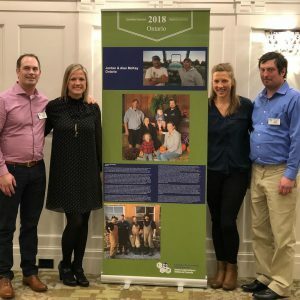 Congratulations to the McKay family, as well as to Double F Farms in Alberta, who were also recognized as Outstanding Young Farmers for 2018!